Well, it's that time of year again, Christmas. I can hardly believe how fast this year is progressing. My students certainly have come a long way since the beginning of the school year. They are so excited about the holiday season. This school year, I have various levels of learning, more so than in previous years. So, I have created activities that have several skill levels. I have planned a lot of fun, creative, and engaging learning activities for them this year. Listed below are a few of the poems, songs, and activities that I am using this year in my PreK class. Keep checking back often as I am continually updating the list of activities. We tied a ribbon from a store. And a bright red hat. And he "ho ho ho's"
From his head to his toes! Shining in the winter night. Christmas candles one, two, three. Shine until the morning light. And I thought it tasted yummy! But I like it better in my tummy! Yummy! and a long cozy nap. The little present is for Mary. This little present is for Ted. This little present is for Harry. This little present is for Ned. "Boo, hoo, hoo! Please put me in a Christmas stocking, too!" And Santa was his name-o! 2. He has a big white fluffy beard. 3. He rides a sleigh of 8 reindeer. 4. He has a sack all filled with toys. 5. He brings the toys for girls and boys. 6. He'll come again another year. 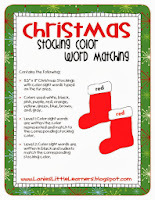 Materials: Stocking Color Word cards available for free. Click on the link below. 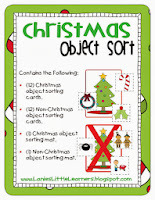 Directions: Seat your students around a table and place the Stocking Color Word cards in a basket. 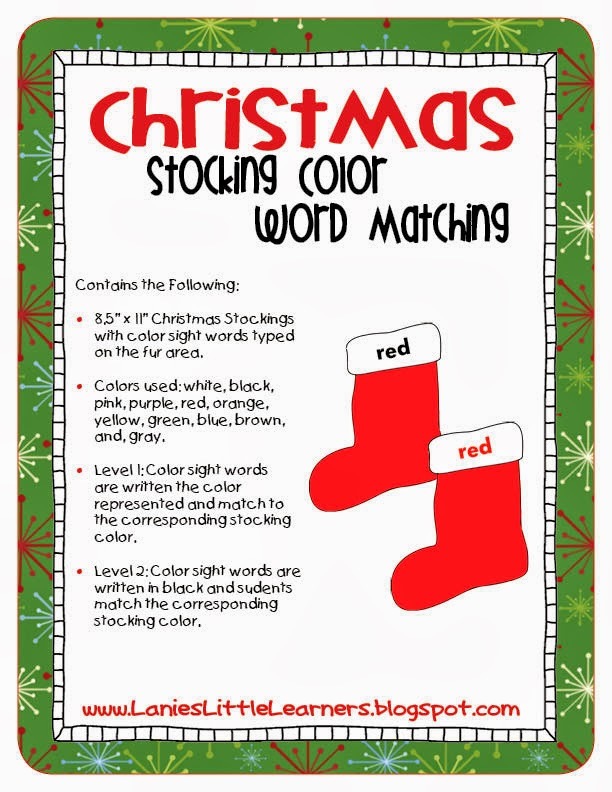 Have the students work in pairs matching the color sight word to the matching color stocking. There are two levels of play. Level 1: Color sight words are written the color represented. Level 2: All color sight words are written in black. Wrap cardboard boxes (large and small) in Christmas gift wrap. Add them to the block center for children to stack. Decorate a large cardboard box to look like a gift box, and play this guessing game. While everyone’s eyes are closed, tap one child on the shoulder. That child will crawl in the big gift box. Tell the children to open their eyes and guess who is missing from the circle. Use a sturdy green paper plate and cut out the middle and send one home with each student. Encourage their family to creatively help them decorate their wreath. 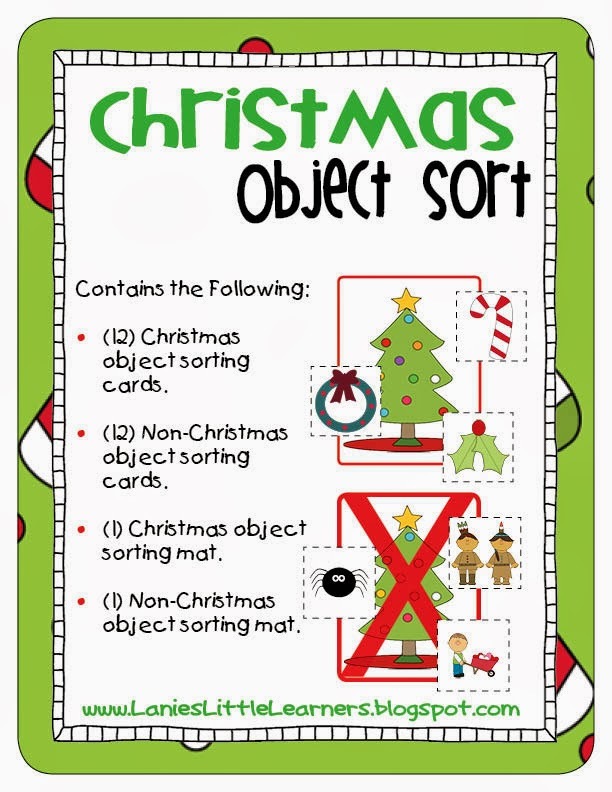 Materials: Use the Christmas Sort cards. Have students sort the cards into Christmas and Not Christmas. Two levels of play. Level 1: Students can place pictures about Christmas into a stocking. Level 2: Have the students place pictures about Christmas on the Christmas tree and pictures not about Christmas on the Christmas tree with a red X.